Of course, historical buildings such as Weddington Castle do not simply vanish without a trace. The Castle has left a lasting legacy upon the area - as well as some intriguing mysteries. At this point in time - over 80 years after its demolition - Weddington Castle is passing out of the realm of living memory, and so the first hand recollections of those who knew the Castle during its existence are lost to us. As mentioned in the Introduction, what we do have left are disparate documents, both written and photographic, with which to try to recreate a sense of what once was. But we do have something else to help us piece the past together. We have the physical traces that such a building inevitably leaves behind - despite the best efforts of modern developers. Whilst a building such as Weddington Castle can be demolished, the bricks and mortar of which it was constructed do not just disappear. Indeed one can argue that the Castle never went away in one sense, for it is rumoured that the rubble was used to build the subsequent Weddington housing estate of Castle Road and Shawe Avenue upon, although some possibly went to the Countess Road area on the other side of Nuneaton. It seems that nothing was wasted by the builders 'Watson and Howe': the face brickwork of the new estate buildings was backed in with bricks from the Castle before being plastered over, wood joists from the Castle were used for roofs and floors, and even the lead was reused in the new houses' for bays and gulleys*. "Weddington Hall was encased by Robert Lugar in a castellated facade of finely chiselled Attleborough grey sandstone over the original Elizabethan Hall. Even in 1928 this was not cheap demolition rubble. It had a premium value as fine quality building stone and I would have thought Percy, knowing his keenness to maximise his return, would have sold it off as a job lot, not just bulldoze it and leave it as a great rubble field under Castle Road. There is no doubt that other parts of the building were sold as job lots. I found an article about the sale of the structure in the Nuneaton newspapers in 1928 with comments made to the effect that the grand wooden staircase was sold as a lot. Someone else bought the doors and windows. Floor boards etc. There is unfortunately no mention of the stone work. "I suppose there are two ways of putting this mystery to bed. Doing a core drill in a garden in Castle Road and see if we hit a bed of grey sandstone down there, or trawl the USA looking for a castle with a resemblance to Weddington. No doubt the answer will come in due course, the USA is a big country, but there can't be many castellated mansions out there built of Attleborough sandstone!" So who knows - just like the original London Bridge, Weddington Castle may have been shipped across the Atlantic and rebuilt somewhere in the USA! Only a possibility of course, but a fascinating one, which Weddington Castle Online shall continue to investigate.... If anyone has any information regarding this please email us at: info@weddingtoncastle.co.uk (however, in 2017 we did receive information of a large sandstone block being found in the rear garden of a house in Castle Road. Could that be from the Castle? We may never know as it has disappeared...). From 1928, two large residences: Weddington Gardens and Alsted Lodge (on Weddington Road), were built by Hope & Aldridge builders, and some of the Castle timber is believed to be in the latter. Weddington Gardens was demolished in 1974-5 to make way for the Cleaver Gardens flats, although its quartzite gateposts - now reduced from 8 feet to 3 feet high - remain next to the Weddington Post Office / 'One Stop Shop'. The first part of the Weddington housing estate was built between 1930 and 1933, effectively joining the village to Nuneaton with compact blocks of houses rather than the previous ribbon development along Weddington Road (formerly Derby Lane). Effectively, Weddington ceased to exist as a distinct village in its own right at around the same time as its Castle. From 1935 to 1938 houses were built in Castle Road. Also, in 1938, the Grove was converted by Captain Cunliffe Shawe into the Weddington Hotel. 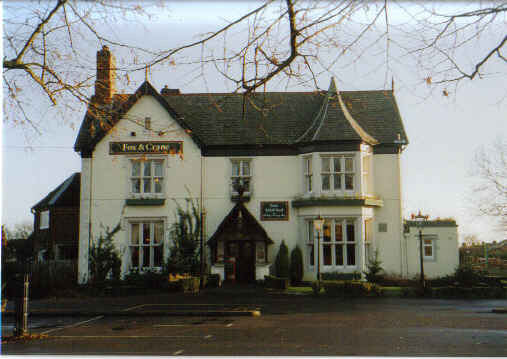 This later became 'The Grove' pub and then 'The Fox and Crane' pub restaurant in 1996. As regards the actual contents of the Castle, many of these were sold off by the auctioneers James, Styles & Whitlock, some of which are believed to be in the United States. Examples of sale items include a fine old oak staircase and Italian carved marble mantelpieces. Over the following decades Weddington has continued to develop: an inevitable result of Nuneaton's expansion yet one which has continued to erode the remnants of the old village. Whilst the original arrangement of the Church, Church Farm and the Rectory survived into the 1950s, the old Weddington Rectory was demolished in 1961 (intriguingly, part of it had been closed off as it was said to be haunted)... Its demise heralded a new wave of housing development in the area and by the 1990s the modern village had spread right up to the churchyard and Church Farm had been demolished. Another building from the Castle estate to fall victim to demolition was the Northern Gate-house Lodge, which was destroyed in 1961 (the last resident being a Mrs Jessie Pearson). This building was a stylish Baroque/Palladian bungalow with a rounded portico veranda (a mock up of the building can be seen here). Despite the passage of time however, Weddington Castle and its estate has not quite given up all of its secrets. For instance when, in 1988, the original Lower Farm was demolished, a high quality timber-frame building was discovered within its construction. Its design belonged to the South Western School and the frame bore numerous carpenter's marks, with the main doorway (measuring less than 67" high) skilfully carved with rebates and grooves. A number of explanations as to the origins have been put forward, such as that it may have been the in situ remains of a sixteenth century grand manor or farmhouse. Another possibility however, is that it comes from a larger sixteenth century building which was demolished and sold - Lindley Hall is possible, or even Weddington's own Capital Mansion House: the precursor of Weddington Castle. This important historical artefact was carefully dismantled and the oak beams saved. These have now been incorporated into a house at Ashbourne in Derbyshire. Also, for many years a local legend persisted of tunnels between the Castle and the Lodge and Church, and although when the Northern Gate-house Lodge was demolished such stories were not borne out, a tunnel was apparently discovered which led from the Grove to the Castle during the former building's conversion into the 'Fox and Crane' pub restaurant in 1996. "No archaelogical deposits or artefacts of medieval date were found during the evaluation. The absence of graves and human remains is surprising as these would be expected to be adjacent to the medieval church. The lack of human remains in this area suggests that the main area for burial is located further away from the church. The area evaluated contained modern services and a spread of rubble. It is possible that the latter is a remnant of building demolition rubble from the earlier church; the Rev. Tony Adams reported that such areas of rubble are located all over the churchyard". More substantial reminders of the Castle do persist to this day; the street names Castle Road and Shawe Avenue for instance, named in honour of the Castle's former owner (this was originally called simply, 'the Avenue'). Indeed the Castle's original stone crest of arms is preserved in the frontage of numbers 1 and 3 Shawe Avenue. This bears the Kay family motto: 'IN DEO SOLO SPEC MIA' (In God alone is my hope). Wells from the Castle survive near 18, 31 and 74 Castle Road; the Weddington Social Club was built upon the site of the icehouse, and the Southern Lodge building from the Castle grounds remains as a private residence at 6 Brook Lane, off Weddington Road (pictured right). Another local house features a door from the Castle. The avenue of yew trees leading from the Post Office / 'One Stop Shop', parallel to Brook Lane, are the original trees that lined the southern driveway of the Castle estate. A further cluster of trees can be seen by the play area in Sandon Park. This Park was once part of the ornamental gardens surrounding the Castle, and there are still slight depressions in the ground which indicate the position of a lengthy boating lake constructed within the estate. And of course there is 'The Grove' on Weddington Road, later 'The Fox and Crane' pub restaurant. Despite the change in usage of this building the interior and exterior were sympathetically maintained, and one still gained a sense of the grandeur of this former house and what remained of its grounds. The Fox & Crane closed for the final time on Tuesday, 15th January 2008. 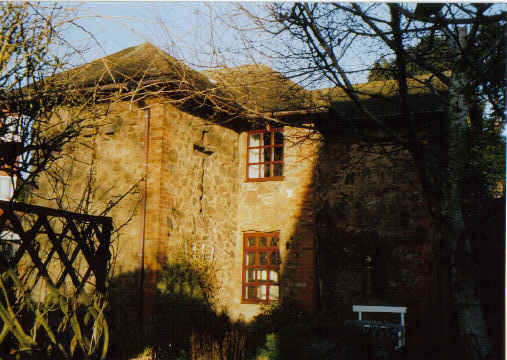 This building - probably the oldest significant surviving historical building in Weddington after St James' Church - was purchased by AR Cartwright Ltd builders in December 2007, and planning permission was granted for the building to converted to flats, with 18 semi-detached housing to be built in the grounds. In 2010 the first residents moved into this development - the main access road to which is named "Lionel Close" after Lionel Place who formerly owned the Weddington Castle estate - the Grove itself was saved from demolition by developers by a public campaign, and is now being renovated into luxury apartments. Finally, Henry Shawe's dedicated windows remain at St James' Church... and if one takes a stroll through the Weddington churchyard, one will find a roll-call of personalities from the Castle's history written upon the gravestones. From Humphrey Adderley to Henry Kay, from Francis Vincent to Lionel Place to Henry Cunliffe Shawe himself. One can think of no more poignant reminder of how we are all inextricably linked to our ancestors through a common bond. For we are all part of history; be it past, present or future. Thanks to John Bedingham, former employee of 'Watson & Howe" for providing this update in 2013. As of 2013 the co-owner of 'Watson & Howe': Peter Watson, was still alive, having emigrated to Perth, Australia in 1968.